The Bengal Famine of 1943 was a direct consequence of World War II. With the Japanese take-over of Burma, trade with British India was cut off, including all-important rice imports. Bengal then, as now, was a huge food importer, especially rice. Burma was a major source of for food products and this trade suddenly came to a halt. The resulting food imbalance caused the deaths of 2 million. And not a shot was fired. This famine was about rice because life in Bengal is about rice. It is an old saying, but the Government of India's Famine Commission Report (1945) described Bengal as "a land of rice growers and rice eaters". On the growing side, rice accounted for around 90 percent of arable land under cultivation. Bengal produced one third of India's rice. On the eating side, "rice accounted for between 75 and 85% of daily food consumption." (Maharatna, Arup, 1993). This level of subsistence on a single food source has few parallels. Pacific Islanders and Greenlanders naturally heavily rely on fish and seafood products. Native peoples on the American and Canadian plains need the buffalo for many reasons: food, wool, horns shaped into tools, tallow, and other uses. During the Ice Age, humans were equally reliant on the Wooly Mammoth, that supplied many of the same purposes as the buffalo. Their huge bones provided the supports for their tents, made from their hides. This was critical in a climate with few trees. The only modern comparison that comes to mind is the Irish and the potato. By 1840, the potato was widespread in Ireland. But it was much more class based, especially between the Catholics and the Protestants. One half of the population existed on a diet of almost all potatoes, with the occasional dairy or fish product. This is very similar to the Bengalis, where fish is the source of occasional protein for them as well. These parallel cases are not very comforting in this instance. The reliance on the potato resulted in disaster, and such was the case with rice in Bengal. The cut-off of rice from Burma had the same affect as the potato blight in Ireland. People survived, died, or migrated. Madhusree Mukherjee book (“Churchill's Secret War,” 2010) blamed Churchill for exacerbating the famine by diverting food away from Indians and toward British troops around the world. This claim has been disputed by many, including the Churchhill project. Japan invaded Burma in December, 1941 and within months controlled the country. During this time, of the 500,000 Indians fled back to India. The sudden influx of refugees accelerated the food problem. A healthy rice harvest in 1944 stopped the famine. The famine was an indirect consequence of the conflict but illustrates how the link between environment and livelihood can be easily broken when prople's are surviving at basic subsistence levels. This disruption in supplies could have been handled, notwithstanding some distress. In fragile regions such as Bengal in 1943, this was one area that could not withstand the pressure. Bengal has wet and dry seasons. Most rainfall comes during the monsoons. Tropical cyclones can be particularly catastrophic in such circumstances. Both international and civil war can lead to famine in fragile states. This case from 1943, reminds us of today's conflicts in Yemen, Somalia, South Sudan, and Central African Republic, among others. Famine in all of these cases are a consequence of conflict. In each place, people lived on the edge of subsistence. Although the direct deaths from war was low, the indirect deaths were massive. Policy mistakes exacerbated the crisis, as well as indifference. Estimates range from 1.5 to 3 million. Deaths were actually from a variety of factors. 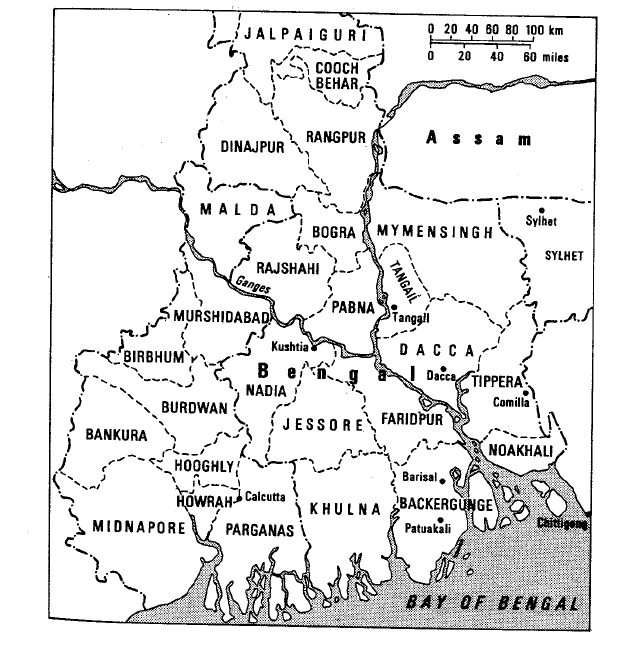 Bengal then was much like Bangladesh today: over-populated, poor, susceptible to drought and floods, and barely surviving at subsistence levels. 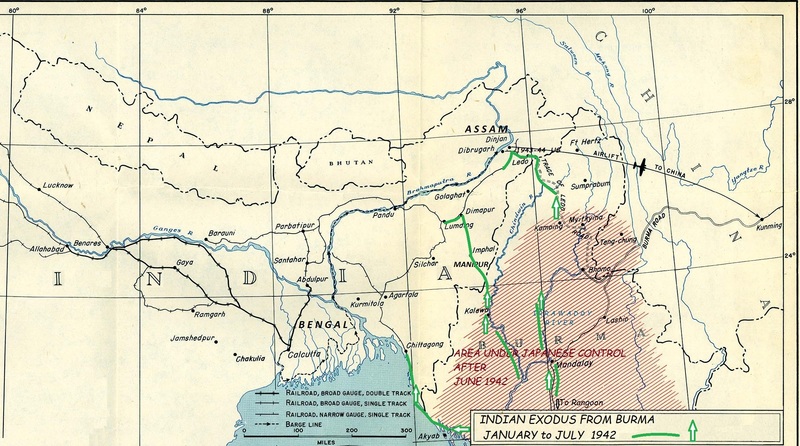 The war halted food import from Myanmar, but also brought India on a war footing. The British would not allow the Bengalis to import these food stuffs from other sources, citing both war needs and maintaining a good balance of payments. The latter factor was a factor in the Irish famine and British trade policy. Once the downward spiral began it snowballed. Disease broke out which further sapped the social and economic fabric. This land to highly speculative markets and economic turmoil. This was not a conscious war strategy, but an occupier's transcendent needs for food that sparked this event. The response, which made things worse, was also an occupier's choice or strategy. Bengal was caught between the British and Japanese Empires. These events were all part of decisions made by Britan and Japan during World War II. "In the prior year, 1942, when Japan seized Burma, an important rice exporter, the British bought up massive amounts of rice but hoarded it. The famine only ended because Bengal thankfully delivered a strong rice harvest by 1944." (Lazzaro, 2013) Like the British during the Irish potato famine, the British again refused to allow the import of replacement foods. For Bengali's this can only be a loss. Maharatna, Arup (1992). The demography of Indian famines: A historical perspective (Ph.D.). London School of Economics and Political Science (United Kingdom). Maharatna, Arup (1993). "Malaria Ecology, Relief Provision and Regional Variation in Mortality During the Bengal Famine of 1943–44.". South Asia Research. 13 (1): 1–26.